Do you want to impress your cute little brother? We have a special collection of fancy, funny, charming, cartoon shaped, superheroes series and more variety of Kids Rakhis for your little brother. Convey your innocent love with your cute little brother through muskbird.com. 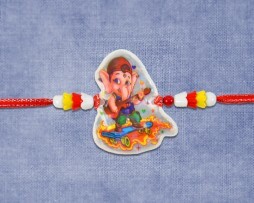 If your brother is young then you will like our special rakhi collection for him on RAKHI FOR BROTHER page. You can also buy special designed rakhi for your bhaiya and bhabhi from RAKHI FOR BROTHER & BHABHI page.